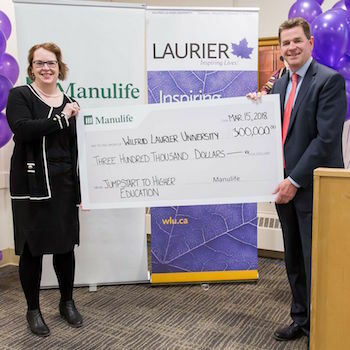 Waterloo – Manulife has announced that it is donating $300,000 to expand Wilfrid Laurier University’s Jumpstart to Higher Education program to Brantford as well as to more schools in Waterloo Region. The funding from Manulife will extend support of this innovative program to more Grade 7 and 8 students from at-risk communities, equipping them with resources to make big decisions about post-secondary education when the time comes. Jumpstart to Higher Education’s mandate is to provide students, parents and teachers with information about the pathways to post-secondary education. The program includes information about funding and career options and encourages strategic thinking about which courses to take in high school to ensure students can achieve their education goals. Additionally, there is a research component to the program through the Poverty Reduction Research Group, part of the Centre for Community, Research, Learning and Action (CCRLA) at Laurier, to measure the long-term impact of this program with the goal of eventually incorporating it into the Ontario junior high curriculum. Manulife values innovative programs that support the community along the journey to financial opportunity and wellness. Through its philanthropic commitments to Laurier over the past four decades, Manulife has invested in several social impact initiatives such as the Manulife Centre for Community Health Research, the Manulife Lecture Series, Manulife Scholars of Distinction and the Lyle S. Hallman Faculty of Social Work building. Manulife Financial Corporation is a leading international financial services group that helps people achieve their dreams and aspirations by putting customers' needs first and providing the right advice and solutions. Manulife operates primarily as John Hancock in the United States and Manulife elsewhere. Manulife provides financial advice, insurance, as well as wealth and asset management solutions for individuals, groups and institutions. At the end of 2017, Manulife had approximately 34,000 employees, 73,000 agents, and thousands of distribution partners, serving more than 26 million customers. As of December 31, 2017, Manulife had over $1.04 trillion (US$829.4 billion) in assets under management and administration, and in the previous 12 months made $26.7 billion in payments to customers. Manulife’s principal operations are in Asia, Canada and the United States where it has served customers for more than 100 years. With global headquarters in Toronto, Canada, Manulife trades as 'MFC' on the Toronto, New York and the Philippine stock exchanges, and under '945' in Hong Kong. Jumpstart to Higher Education was launched in 2013 with the support of the Astley Family Foundation. Conceived by Gail Forsyth, director of Teaching, Learning and Retention at Wilfrid Laurier University, and designed by a former principal, Jan McPhedran McLeod, it aligns with the “Creating Pathways to Success” initiative launched by the Ontario Ministry of Education in 2014. The program is administered through the Office of the Associate Vice-President of Teaching and Learning at Laurier, and since its inception has reached over 5,000 students across Waterloo Region.